Our family really enjoys Roahl Dahl books including Charlie and the Chocolate Factory. It is such a fun book to do as a read-aloud. We read it earlier this year and did a small study to go along with it. Homeschool Share has a Free Chocolate Unit Study. We made a Candy Sensory Bin just for this unit. Making our chocolate playdough recipe would be a great activity to go along with this book. This chocolate tasting activity from Homegrown Friends looks like it would be fun. The Imagination Tree has Willy Wonka and the Chocolate Factory playdough. 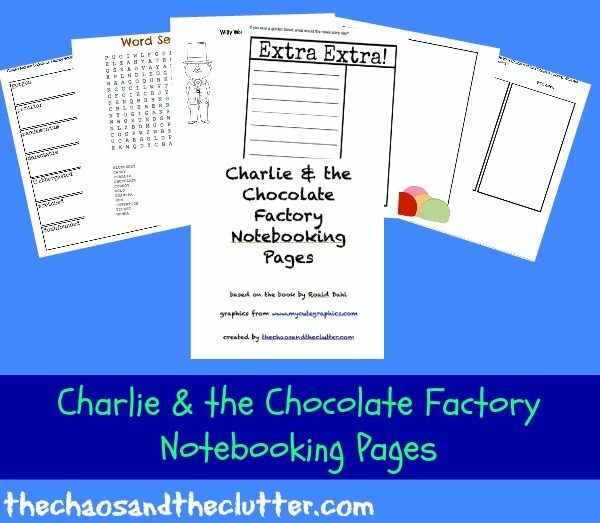 I have created a free 15 page printable pack to accompany a Charlie and the Chocolate Factory unit study. It contains notebooking pages, a word search, a vocabulary words worksheet, and some fun writing activities. If you are looking for other activities to accompany book studies, you may be interested in following my Book Activity Ideas board on Pinterest. Thank you so much! We actually started reading Charlie and the Chocolate Factory today, so these printables are going to come in handy.